This report will produce a Certificate of Analysis (COA) style report (similar to existing COA reports in WinSPC), but will also contain a list of tag names and unique tag values at the top of the report. The report will combine the tag values for each of the variables into a comma separated list of unique tag values. This report can be useful if you are filtering your underlying dataset by one tag value (such as “Order Number”), but want to see a list of all the “Serial Numbers” that were entered as tag values for that particular “Order Number”. This report will produce 1 page per WinSPC part that is contained within the underlying dataset or object the report is executed on. If the part contains more than 40 variables, multiple pages will be produced for a single part, but a single report page will only show information regarding a single part. Please note that if multiple report pages are produced for a single part, the list of tag values at the top of the page will only represent the tag values associated with the variables shown on that page of the report. Add ‘gray banding’ to allow for easier reading of the rows. This will alternate gray/white graphical bands every group of 3 variables (the first three variables will have a gray background, the next 3 will have white, etc.). Color the values in the ‘Cpk’ according to its value. Cpk values less than 1.00 will be red, values between 1.00 and 1.33 will be yellow, and values greater than (or equal to) 1.33 will be green. Color the values in the ‘Cp’ column (according to the same rules for the Cpk coloring). Color the values in the ‘Ppk’ column (according to the same rules for the Cpk coloring). Color the values in the ‘Pp’ column (according to the same rules for the Cpk coloring). 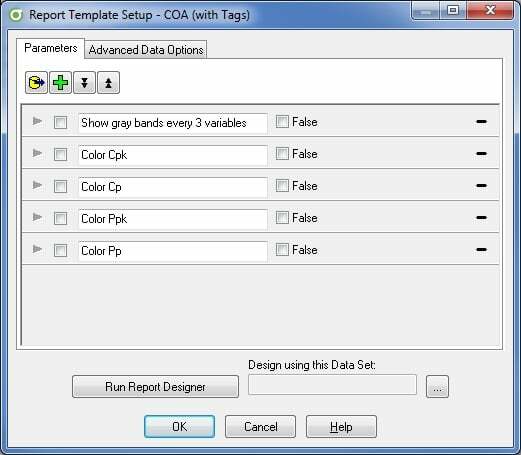 To turn a color option on or off, open up the properties of the report template, click on the checkbox next to the ‘True’/’False’ text for the item and then click “OK” to save the report template. A couple sample outputs of the report can be seen by downloading the PDF attachments below. To use this report template, simply download the report template export (“COA (with tags).exp”) from the attachments below and import the template into your WinSPC system.